This morning I went through hip replacement surgery. 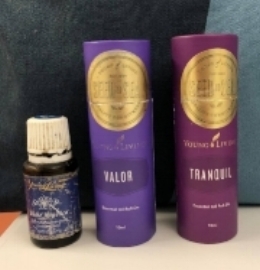 And I would like to, once again, share with you the amazing power of the combination of Heartfull™️ Meditation and Young Living Essential Oils! Before going in I used White Angelica while cocooning - helping to connect deeper with my soul and to ward off negative energy. On my chest and temples I put Valor for bravery and on my wrists I rolled Tranquil. This combo worked like Magic! I was not nervous at all and felt trusting and confident. In the evening before I used some other oils as well, and slept like a baby through the night! Since then several friends and fellow yoga teachers have asked me to blog about my experience of the process. I was quite reluctant to the idea to start with but as I understood that it could be of use to others, I’ve decided to go along with the request. It was pointed out to me that mine might not be the typical experience, so if anything I’ve done can help either others in a similar situation or yoga teachers to take better care of students with hip replacements, I’m glad to be of help. It recently came to me that the very first time I felt that something was off in my right hip was three years ago. I had just come back on a long flight from a Therapeutic Teacher Training with my teacher Aadil Palkhivala at the Alive & Shine Center in Bellevue, Washington, USA. Only shortly thereafter as I was walking the streets of Stockholm a very sharp pain in the hip joint stopped me. The pain slowly faded after a few days, but from about then on the mobility in the hip started changing. Both X-rays and an MRI were taken and they showed that the cartilage was fairly worn. But the pain went away and I continued as before. If I go even further back in time, some 25 years or so, while I was practicing Ashtanga Yoga six times per week, that same hip would sometimes feel as if it would dislocate. My joints have always been extremely mobile and for years I did a very strong asana practice with very little awareness of alignment or anatomy. Maybe that’s when the physical process started. Who knows? However, in February of 2017 I slipped on black ice and fractured my left kneecap. In a brace and on crutches for 6 or 7 weeks is what finally started the slide toward the surgery. I’ll leave you with that for now and will tell you more about the stage after that in my next post.